If you like the idea of a radio mic but don't want the hassle of wiring up base stations, plugging in PSUs and screwing on antennae, the Xvive U3 might appeal, as it is well suited to smaller gigs and is extremely straightforward in operation. Both the transmitter and receiver are built into what are effectively oversized XLR connectors, so you simply plug the transmitter directly into the back of your mic and the receiver directly into the XLR input of your mixer. It is even safe to plug it into a phantom-powered mixer input, though you can't charge or power it from phantom power. A switch on the transmitter can be used to select line‑level input sensitivity for use with electronic instruments, and Xvive also make a similar system with a swivel jack at the transmitter end and a suitably high input impedance, specifically for connecting electric guitars and basses. Power for both transmitter and receiver comes from internal, rechargeable lithium‑ion batteries, giving around five hours of continuous run time from a full charge. You will need a USB power source to charge the units; none is included, but a Y cable is provided so you can charge both pieces at once from a single outlet. Circular displays surrounding a step button on each unit allow the user to select from one of six channels (each of which automatically selects the best of three frequencies), and because the U3 works on the 2.4GHz band shared by Wi-Fi, no licence is needed to operate it anywhere in the world. All six channels can be used at the same time if you have multiple systems on the same stage, and the range is as much as 90 feet if there are no obstructions. Even with minor obstructions, there should be no problem reaching the stagebox or mixing desk in smaller venues, but you may run out of range if you have a gig at the O2! The manual advises to set up at least three metres from Wi-Fi routers to reduce the risk of interference. All digital radio links exhibit some latency, but the 5ms delay typical of this system should not be an issue unless you are using in-ear monitoring, in which case those with sensitive hearing may be put off by the timbral changes that can occur due to the internal bone-conduction not being exactly aligned with what comes back via the in-ears. This is a factor with all digital wireless systems, though, not just this one. Certainly the technical spec of the U3 system is impressive: its 48kHz, 24-bit converter resolution yields adequately low distortion, a 20Hz to 20kHz frequency response, and a dynamic range of 110dB, which is better than you'd expect from even the better UHF systems. The cases are made from cast metal at the connector end, with a plastic shell at the other. Both the transmitter and receiver have a small power slide‑switch and a shallow recess for the channel selection button, while on the transmitter this switch is joined by another for choosing line or mic mode (all the switches are designed to prevent accidental operation). The units feel substantial and rugged without being excessively heavy, and the transmitter has a latching XLR to keep it in place. The active channel is illuminated in blue when the device is powered up, so this doubles as a power-on indicator, and when the two devices are in communication, a green LED on the receiver also illuminates. Two red LEDs on the transmitter flash briefly on power up and then go off. If they come back on, the battery is below 30 percent charged, and if they flicker it is time for a recharge as that means there's less than 10 percent power left. Clearly there's no phantom power, so capacitor mics can't be used unless they are battery-powered electret types. The batteries are not user accessible, as far as I can tell, so if you do run out of charge during a gig you can't fit new ones. There's also no explanation as to how to replace the batteries at the end of their life, so it may be a case of returning the system to a service centre. A full charge takes around 2.5 hours, but a one‑hour charge will get you through a two‑hour gig. You can also run the receiver from a USB PSU in an emergency. The sound quality was all I'd expect from a digital radio mic system: clean and quiet to the point that it stands comparison with a hard-wired mic. Setup is lightning-fast as there's no base station to configure and no antennae to screw into place — both units have internal antennae. No doubt a bigger system with twin‑diversity receivers would have more range, but for the target market of playing pubs and clubs, range isn't likely to be an issue. If you do go out of range, the sound breaks up but doesn't dissolve into noise in the way analogue systems can. For gigging performers who don't like complications and who want to add a cable-free mic or two to their show, this is a very practical and affordable system. 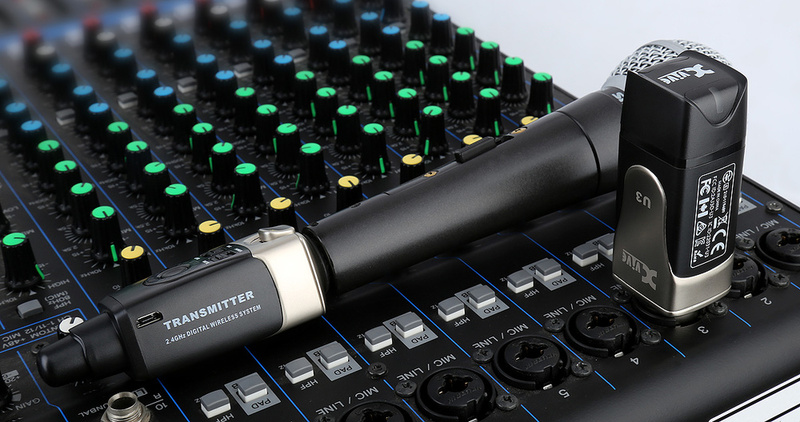 Line 6's affordable and compact wireless mic and guitar systems are worth checking out, as are Rode's and Audio‑Technica's wireless options, alongside systems from the major EU mic companies. However, the Nux B3 system is the only alternative I've found that has the same format as the Xvive U3. Rechargeable batteries reduce running costs. If the battery goes flat at an inconvenient time you can't change it. This is one of the simplest radio mic systems I've come across and is almost as quick to set up as plugging in a mic cable. Even if you forget to charge it, then as long as you put it on charge the moment you arrive at a venue to set up, you should be able to get through the evening. John Hornby Skewes +44 (0)113 286 5381.